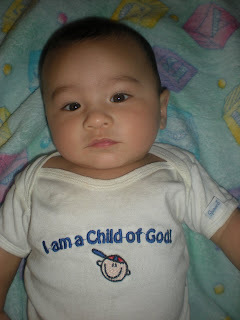 Kyler is... A Child of God. The weekend beginning spring break we went to Utah with my family for the Jazz game. It's something we like to do every year. This year brought a stressful situation but in 30 years when we're old and rich, we will look back at this and laugh I'm sure. Oh, and we put these huge shooting earmuffs on Kyler so he would not go deaf. Ok it all started when Trae wanted a hot dog. On our tickets, we get a free hot dog and pop, but if any of you know me well, hot dogs are not my favorite, so I wanted nachos. Trae graciously accepted the task of retrieving my snack while he was getting his own. On his way back up the dangerous climb, he was thinking, " I cannot and will not fall because I have all this important food that I do not want to drop".Well, reality struck hard and fast. The truth is, Trae did fall, and he fell hard. He hit his knee, but did not drop any food. So basically, he sacrificed his body for our food. When I saw how hurt he really was, we went down to the first aid and got help. They told us it was serious enough that he needed to go the ER. Don't even get me started on how long and stressful that was. In the end, we saw about 10 minutes of the Jazz game, and spent 3ish hours in the ER. Trae did not end up getting stitches because we already were rackin up the bill going to the ER and getting x-rays. We didn't want to pay for anything else so he politely declined, all due the cold hard fact of money (that and he's scared of stitches) but anyways. No serious damage occurred. Although I did see some fat in his huge gash, that was kinda cool and gross at the same time. Ok I could go into a lot more detail but I'm tired of writing about the matter. If you absolutely need to know more, just call me. I could tell ya a lot faster than I can type it. Kyler's friend Paxton. Look how good of buddies they are. So cute! That's a bummer about Trae's knee, I hope all is good now. I'm also glad that you are able to use the clothes that you bought. 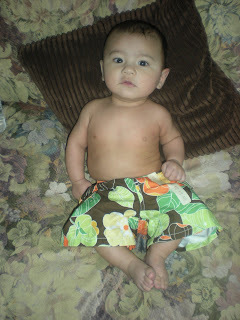 I can't believe how big Kyler is getting! He is so adorable! Trae's little ordeal sure stinks! I got a cut on the knee like that once, clear to the bone. They had to stitch it up inside and outside. It took years to get the feeling back. But it's all better now besides the huge scar :) Too bad you missed the game though. glad trae is okay, and so glad he saved your food! :) kyler is getting so big. we are going to utah april 8-11 for my sisters wedding, maybe we will stop by on our way home and see you guys if you are home?